– Isaac Larian, CEO of MGA Entertainment and creator of Little Tikes and the #1 toy L.O.L. Surprise! Toys“R”Us is on the verge of permanently closing its doors. It feels like the end of an era, with sad headlines spreading across news and social media, BUT there is still time to save this American icon—and you can help. This GoFundMe campaign is spearheaded by Isaac Larian and various investor associates. Isaac Larian is the CEO of MGA Entertainment, Inc. (MGAE), one of the world’s leading privately held toy and entertainment companies and creator of family favorite brands including Little Tikes. Isaac and his associates are devoted to saving the retail chain and preserving the Toys“R”Us experience for future generations. 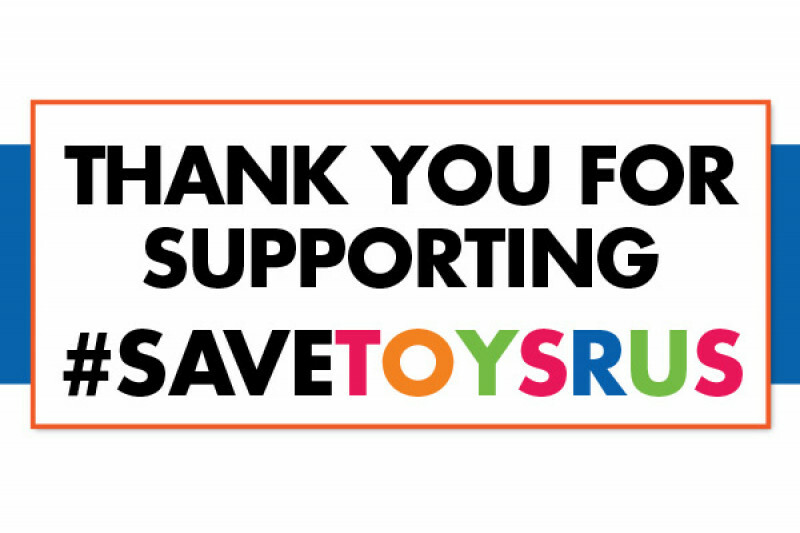 #SaveToysRUs bumper sticker. Please review READ BEFORE DONATING before proceeding. #SaveToysRUs bumper sticker & #SaveToysRUs Special Edition Num NomsTM. Please review READ BEFORE DONATING & TERMS before proceeding. #SaveToysRUs bumper sticker, pin, & Special Edition L.O.L. Surprise!TM. Please review READ BEFORE DONATING & TERMS before proceeding. #SaveToysRUs bumper sticker, pin, magnet, & Special Edition Little Tikes® Cozy Coupe®. Review READ BEFORE DONATING & TERMS before proceeding. #SaveToysRUs sticker/pin/magnet, “I’ll ALWAYS be a Toys“R”Us Kid” shirt & Little Tikes® Build-a-HouseTM. Please review READ BEFORE DONATING & TERMS. Sticker/pin/magnet/“I’ll ALWAYS be a Toys“R”Us Kid”shirt & Little Tikes® Super Slam ‘n DunkTM. Review READ BEFORE DONATING & TERMS. #SaveToysRUs sticker/pin/magnet/“I’ll ALWAYS be a Toys“R”Us Kid”shirt/local Toys“R”Us party & Little Tikes makeover. Review READ BEFORE DONATING & TERMS.